I am a collector of all things beautiful. I generally don’t care for trade-show bits or manufactured saddles. Ok, ok, I’m a bit of a snob. But we don’t have endless amounts of tack like this, just an occasional larger purchase for anniversaries, birthdays, or Christmas. Or a must-have once in a while when we see something and happen to have the cash handy. Our boys are going to receive some fine tack down the road, and that’s pretty exciting to me. Christmas is not all that far off, and for many makers, Christmas is crunch-time. The earlier you can get your order in, the more likely you’ll receive it in a timely fashion. It also relieves the schedule for the artists. I also encourage you to support these artists year-round. This is a lifestyle and commitment for these makers and they rely on you. I am providing you with some of my favorite makers and unique gear that I have used or know is great. I hope you will at the least check out their gear and maybe send some business their way if you see something you like. Be sure to tell them Savanna sent ya! I discovered Gloria Keys’ fine work through her Facebook page and later checked out her website: www.TheColorfulCowgirl.com. She donated several of her unique mane-hair get-downs to the Wyo Wild Ride Ranch Rodeo in Gillette, Wyoming. She didn’t set up a booth there (it would be quite the trek over from where she lives in Great Basin country), so it was that much neater that she would donate the hair-ropes. Gloria is a fourth generation mecate maker and those many years and generations of twisting rope has resulted in a fine-product but priced very reasonably. What sets Gloria apart is that her mecates feature color, and lots of it! I personally own a turquoise, brown, and grey get-down and love it. It makes a pretty great lead when I’m ponying my son (and easier than a lead to tie on his horn if he chooses to go solo) as well as a get-down when I’m riding straight up in the bridle. You can go check out Gloria’s website on your own, but I wish to highlight a little history. She and her mother, grandmother, and great-grandmother have a rich one. I am Helen’s Daughter, Frankie’s Granddaughter, and the Great Grandaughter of Clara Whitby; which makes me a fourth generation Mecate Maker. I started helping my Mom Helen and Grandma Frankie twist mecates when I was about 8 years old. I grew up on the Hammond family cattle ranch in Northern Nevada between Winnemucca and Midas, and my Grandpa and Grandma Dougal’s ranch near Jordan Valley, Oregon. My Mom and I keep the family art of Mecate making going by making these traditional type Mecates. We make all of our Mecates by hand from horse mane hair only, and we do not believe in using cores of any kind in the center. We stay with our Grandmother’s traditions from the early 1900’s. 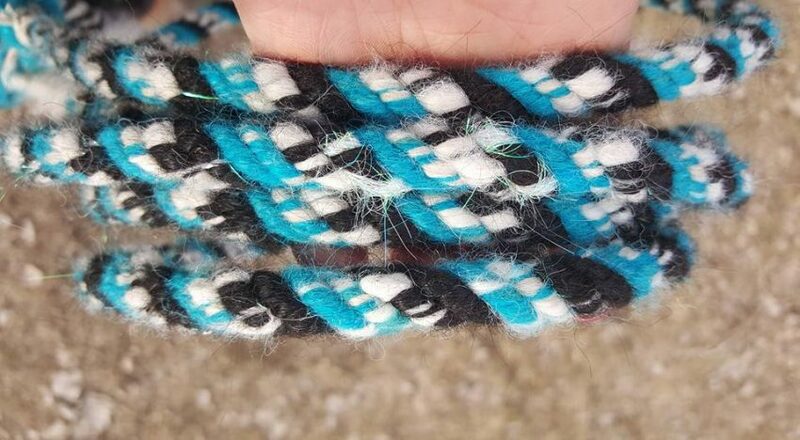 All of our ropes are one of a kind, no two are exactly alike. 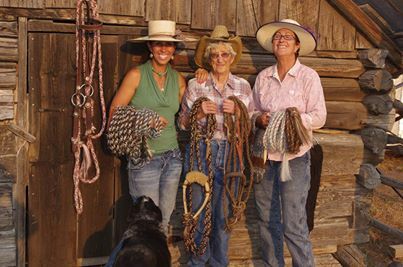 We believe horse mane is the best for our ropes because it is soft, and easy to work with. We do our best to make them out of other textures upon special request like mohair and human hair. I have put my own exciting twist on the traditional Mecates by adding color to them like turquoise, pink, purple, green and whatever color I can get. 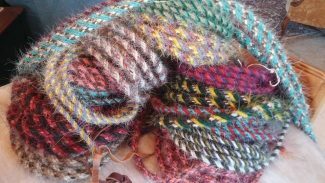 I like to mix dyed colors with the natural colors to make a one of a kind useable piece of art. I use white mane hair and dye it to a specific color. Gram Frankie and my Mom didn’t like the idea, but I got an order for a pink and white Mecate and it went from there. Now I add bling to my Mecates on the leather popper ends such as rhinestone or stone rivets and steel studs. When I was growing up I was called “The Colorful Cowgirl” because I would wear purple, red and turquoise wranglers and colorful shirts to match while I was working and riding on the ranch. So I thought “The Colorful Cowgirl” was the perfect name for my Mecate business. Tell Gloria we, at Cavvy Savvy, sent you her way and she’ll offer $20 off a mecate! (I know fellow Cavvy Savvy blogger The South Dakota Cowgirl Jenn Zeller is a fan too!) The Colorful Cowgirl’s deadline for Christmas orders is Oct. 15.